Top played bottom as Stansted welcomed Barkingside; the hosts on an unbeaten run of seven, while Barkingside have found a way to put points on the board and went into the game unbeaten in three. Barkingside won an early free kick which Dan Jones had blocked, but Stansted replied straight away with a ball in the box being blazed over by George Whitby. Another Jones free kick for Barkingside was saved by Charlie Turner, then Ryan Karrer, his Barkingside counterpart, had to divert the ball away from Callum Ibe in a one-to-one that looked for a moment like the Airportmen had found a way through. The resulting corner also needed Karrer to use all of his guile as he came out to punch the ball clear. Barkingside seem to have added some steal to their defence, Derek O’Halem showed plenty of that as his tackle in the box dispossessed Rob Norris just as he was about to have a crack. Stansted too had players prepared to put their bodies on the line for the cause: Jamie Bennett putting in a solid tackle to halt a Barkingside attack, then the next moment having a shot from range that Karrer had to get down low to his right to tip away. 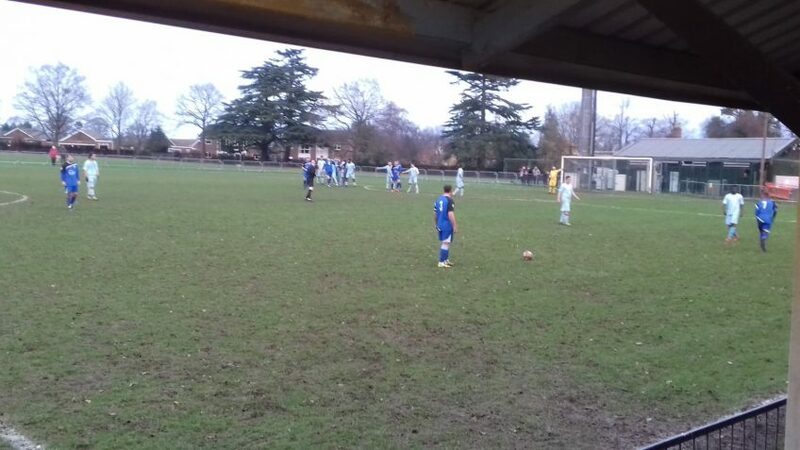 Barkingside did offer the occasional counter at the midway point Isaac Marfo tried a dink that landed on the roof of the net, but Karrer had to cut out two further threatening crosses that were whipped in by Jamie Bennett and Connor Hammond. It was certainly end-to-end, no quarter spaired stuff; remarkably it was hard to tell which of the two sides were title chasers or relegation battlers. I guess the need for points, whatever the reason, can make teams raise their games, and it was quite tense at times. Finally the deadlock was broken on the half hour when David Hornsley had an initial shot saved by Turner, with Oates then scrambling the ball home through a clutch of bodies. Having taken the lead Side then almost doubled it two minutes later when Turner had to dive to his right to palm away a Marfo sizzler. But the Airportmen were able to rally and in the 39th minute a threatening move was crafted by James Peagram, who held the ball up for Ibe, but the resulting shot was steered to close to Karrer who made an easy save. Barkingside went on the front foot themselves in the 42nd minute; new signing Mario Gjini picked up a loose ball in midfield, went forward with it and then hit a shot that wasn’t too far from creeping into the bottom corner. There was enough time for Stansted to have one last go, with a cross tipped over the bar by Karrer and then the resulting corner causing some worry for Barkingside as it bobbled about too close to their goal line: eventually being hooked clear. Stansted continued to knock at the door in the second half, with Harris hitting an early effort only inches the wrong side of the cross bar. And a teasing cross by Ibe floated ominously across Barkingside’s goalmouth that was eventually cleared by Lang. But Barkingside could look dangerous on the counter and they won a corner after Marfo carried the ball forward and having a shot deflected away. And the relegation-battlers went on to win a free kick after Gjini was hauled down outside the box, the resulting kick taken by Oates being cut out by Turner. But it was Karrer, who organised his defence to stunt Stansted, that was having to do most of the work as he had to cut out crosses, with Peagram having a great chance to level the scores, but his glancing header was saved by the Side stopper. But Turner then had to show great bravery to prevent Barkingside extending their lead, diving at the feet of Marfo to claim the ball, having initially got down low to keep out a Hornsby shot. With twenty minutes remaining the question being asked was could Barkingside keep their unbeaten run going, could they keep Stansted at bay? In the 78th minute it looked like Barkingside had given themselves some breathing space as they doubled their lead as Hornsby turned and volleyed a cross beyond Turner. But Callum Ibe remained Stansted’s biggest threat as his pace often got him in good positions to deliver crosses, win free kicks and then having a shot tipped over the bar by Karrer. From the resulting corner Stansted were able to reduce the deficit as substitute Ollie Bell rifled home at the back post. Could Barkingside hold on now for the three points? Woodward had to block and clear a Stansted ball inside his own six-yard box; Karrer had to tip away a Peagram shot in the last minute, then a Clayton shot was deflected wide in the 94th minute. But Fergie time was very much in evidence as Clayton went on to level the scores in the 97th minute when he turned in a last-ditch corner. There was barely enough time left to re-start the game and at the end of the day it may be a case of Stansted clawing back a point, while Barkingside, who would have taken a point at the start of play, perhaps feeling aggrieved that they had been in a position to have taken all three. Stansted then remain top; Barkingside are fighting for their lives and remain bottom, both teams keeping their current unbeaten runs going as they look to get the points needed to complete very differing agendas. Stansted: Charlie Turner, Jamie Bennett, Billy Coyne (Capt), Sam West, Joe Clarke, Paul Clayton, Callum Ibe, George Whitby (Jack West 74’), James Peagram, Rob Norris (Ollie Bell 64’), Connor Hammond (Jack Mitchell 68’). Scorers – Ollie Bell (86’), Paul Clayton (90+7’). Barkingside: Ryan Karrer, Frederico Hernqdez, Akasi Marfo (George Woodward 77’), Dan Jones, Edward Lang, Derek O’Halem, Joe Oates, David Ottley (Capt), Mario Gjini, David Hornsby (Shaquain Maisara 83’), Isaac Marfo (Edward Buchannen (90+2’). Scorers – Joe Oates (30’), David Hornsby (78’).